While the International Space Station was traveling more than 250 miles over the southern part of the Democratic Republic of the Congo in Africa, Japan Aerospace Exploration Agency astronaut Norishige Kanai and NASA astronaut Scott Tingle captured the Dragon spacecraft at 6:40 a.m. EDT using the space station’s Canadarm2 robotic arm. Ground controllers will now send commands to begin the robotic installation of the spacecraft on the station’s Harmony module. NASA Television coverage of installation will begin at 8:30 a.m. Watch online at www.nasa.gov/live. The Dragon lifted off on a SpaceX Falcon 9 rocket from Space Launch Complex 40 at Cape Canaveral Air Force Station in Florida Monday, April 2 with more than 5,800 pounds of research investigations and equipment, cargo and supplies to support dozens of the more than 250 investigations aboard the space station during Expeditions 55 and 56. Among the research arriving on Dragon is a new facility to test materials, coatings and components, or other large experiments, in the harsh environment of space. Designed by Alpha Space and sponsored by the Center for the Advancement of Science in Space, the Materials ISS Experiment Flight Facility (MISSE-FF) provides a platform for testing how materials react to exposure to ultraviolet radiation, atomic oxygen, ionizing radiation, ultrahigh vacuum, charged particles, thermal cycles, electromagnetic radiation, and micro-meteoroids in the low-Earth orbit environment. The Canadian Space Agency’s study Bone Marrow Adipose Reaction: Red or White (MARROW) will look at the effects of microgravity on bone marrow and the blood cells it produces – an effect likened to that of long-term bed rest on Earth. The extent of this effect, and bone marrow’s ability to recover when back on Earth, are of interest to space researchers and healthcare providers alike. 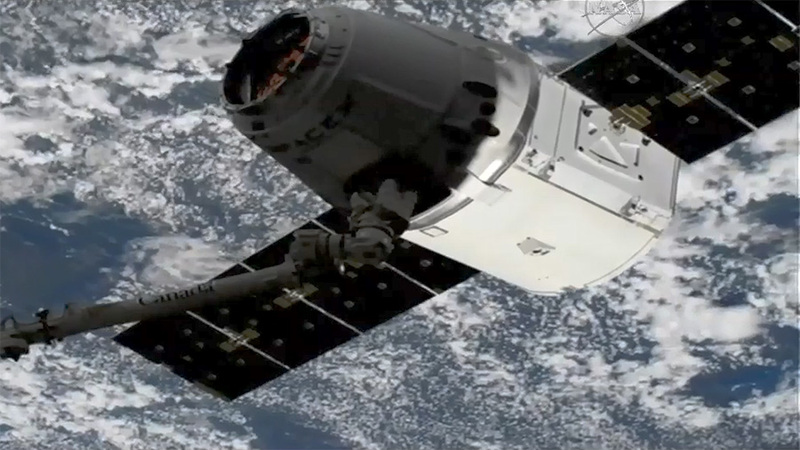 Dragon also is carrying an Earth observatory that will study severe thunderstorms and their role in the Earth’s atmosphere and climate, as well as upgrade equipment for the station’s carbon dioxide removal system, external high-definition camera components, and a new printer for the station’s crew. Keep up to date with the latest news from the crew living in space by following https://blogs.nasa.gov/spacestation/, @space_station and @ISS_Research on Twitter, and the ISS Facebook and ISS Instagram accounts. Useless experiments back on earth. Omg who thinks of these. NASA 52 million dollars a day and still growing vegetables in space. These experiments are testing for the effects of weightlessness and/or the harsh effects of the space environment. These cannot be duplicated on earth. Science and knowledge are always expensive. Ignorance is much more expensive. Hey, I enjoy your stories! Thank you keep all the great news coming! !